The Container Extension example shows how to create a custom multi-page plugin for Qt Designer using the QDesignerContainerExtension class. To provide a custom widget that can be used with Qt Designer, we need to supply a self-contained implementation. In this example we use a custom multi-page widget designed to show the container extension feature. An extension is an object which modifies the behavior of Qt Designer. The QDesignerContainerExtension enables Qt Designer to manage and manipulate a custom multi-page widget, i.e. adding and deleting pages to the widget. You can use all the extensions following the same pattern as in this example, only replacing the respective extension base class. For more information, see the QtDesigner Module. MultiPageWidget is a custom container widget that lets the user manipulate and populate its pages, and navigate among these using a combobox. MultiPageWidgetPlugin exposes the MultiPageWidget class to Qt Designer. MultiPageWidgetExtensionFactory creates a MultiPageWidgetContainerExtension object. MultiPageWidgetContainerExtension provides the container extension. Then we will continue by reviewing the MultiPageWidgetPlugin class, and take a look at the MultiPageWidgetExtensionFactory and MultiPageWidgetContainerExtension classes. Finally, we will take a quick look at the MultiPageWidget class definition. Note: Currently, this particular example can only be used for experimenting and prototyping within QDesigner's workspace. The reason is that uic does not recognize the custom container functionality, i.e., it will not generate the code required to add pages to the container. This issue will be resolved in the next minor release. When Qt is configured to build in both debug and release modes, Qt Designer will be built in release mode. When this occurs, it is necessary to ensure that plugins are also built in release mode. For that reason we add a debug_and_release value to the CONFIG variable. Otherwise, if a plugin is built in a mode that is incompatible with Qt Designer, it won't be loaded and installed. We provide an implementation of the plugin interface so that Qt Designer can use the custom widget. In this particular example we also provide implementations of the container extension interface and the extension factory. The container extension is created as a library, and will be installed alongside the other Qt Designer plugins when the project is installed (using make install or an equivalent installation procedure). The plugin class provides Qt Designer with basic information about our plugin, such as its class name and its include file. Furthermore it knows how to create instances of the MultiPageWidget widget. MultiPageWidgetPlugin also defines the initialize() function which is called after the plugin is loaded into Qt Designer. The function's QDesignerFormEditorInterface parameter provides the plugin with a gateway to all of Qt Designer's API's. In the case of a multipage widget such as ours, we must also implement two private slots, currentIndexChanged() and pageTitleChanged(), to be able to update Qt Designer's property editor whenever the user views another page or changes one of the page titles. To be able to give each page their own title, we have chosen to use the QWidget::windowTitle property to store the page title (for more information see the MultiPageWidget class implementation). Note that currently there is no way of adding a custom property (e.g., a page title) to the pages without using a predefined property as placeholder. The MultiPageWidgetPlugin class inherits from both QObject and QDesignerCustomWidgetInterface. It is important to remember, when using multiple inheritance, to ensure that all the interfaces (i.e. the classes that doesn't inherit Q_OBJECT) are made known to the meta object system using the Q_INTERFACES() macro. This enables Qt Designer to use qobject_cast() to query for supported interfaces using nothing but a QObject pointer. One of the functions that differ is the isContainer() function which returns true in this example since our custom widget is intended to be used as a container. In addition to create and return the widget, we connect our custom container widget's currentIndexChanged() signal to the plugin's currentIndexChanged() slot to ensure that Qt Designer's property editor is updated whenever the user views another page. We also connect the widget's pageTitleChanged() signal to the plugin's pageTitleChanged() slot. First, we retrieve the object emitting the signal using the QObject::sender() and qobject_cast() functions. If it's called in a slot activated by a signal, QObject::sender() returns a pointer to the object that sent the signal; otherwise it returns 0. Once we have the widget we can update the property editor. Qt Designer uses the QDesignerPropertySheetExtension class to feed its property editor, and whenever a widget is selected in its workspace, Qt Designer will query for the widget's property sheet extension and update the property editor. So what we want to achieve is to notify Qt Designer that our widget's internal selection has changed: First we use the static QDesignerFormWindowInterface::findFormWindow() function to retrieve the QDesignerFormWindowInterface object containing the widget. The QDesignerFormWindowInterface class allows you to query and manipulate form windows appearing in Qt Designer's workspace. Then, all we have to do is to emit its emitSelectionChanged() signal, forcing an update of the property editor. Again we first retrieve the widget emitting the signal, using the QObject::sender() and qobject_cast() functions. Then we retrieve the current page from the widget that emitted the signal, and we use the static QDesignerFormWindowInterface::findFormWindow() function to retrieve the form containing our widget. Now that we have the form window, the QDesignerFormWindowInterface class provides the core() function which returns the current QDesignerFormEditorInterface object. The QDesignerFormEditorInterface class allows you to access Qt Designer's various components. In particular, the QDesignerFormEditorInterface::extensionManager() function returns a reference to the current extension manager. Once we have the extension manager we can update the extension sheet: First we retrieve the property extension for the page which title we want to change, using the qt_extension() function. Then we retrieve the index for the page title using the QDesignerPropertySheetExtension::indexOf() function. As previously mentioned, we have chosen to use the QWidget::windowTitle property to store the page title (for more information see the MultiPageWidget class implementation). Finally, we implicitly force an update of the page's property sheet by calling the the QDesignerPropertySheetExtension::setChanged() function. Note also the initialize() function: The initialize() function takes a QDesignerFormEditorInterface object as argument. In addition to allowing you to manipulate a widget's properties, the QExtensionManager class provides extension management facilities for Qt Designer. Using Qt Designer's current extension manager you can retrieve the extension for a given object. You can also register and unregister an extension for a given object. Remember that an extension is an object which modifies the behavior of Qt Designer. When registrering an extension, it is actually the associated extension factory that is registered. In Qt Designer, extension factories are used to look up and create named extensions as they are required. So, in this example, the container extension itself is not created until Qt Designer must know whether the associated widget is a container, or not. We create a MultiPageWidgetExtensionFactory object that we register using Qt Designer's current extension manager retrieved from the QDesignerFormEditorInterface parameter. The first argument is the newly created factory and the second argument is an extension identifier which is a string. The Q_TYPEID() macro simply convert the string into a QLatin1String. The MultiPageWidgetExtensionFactory class is a subclass of QExtensionFactory. When Qt Designer must know whether a widget is a container, or not, Qt Designer's extension manager will run through all its registered factories invoking the first one which is able to create a container extension for that widget. This factory will in turn create a MultiPageWidgetExtension object. Finally, take a look at the domXml() function. This function includes default settings for the widget in the standard XML format used by Qt Designer. In this case, we specify the container's first page; any inital pages of a multi-page widget must be specified within this function. Remember to use the Q_EXPORT_PLUGIN2() macro to export the MultiPageWidgetPlugin class for use with Qt's plugin handling classes: This macro ensures that Qt Designer can access and construct the custom widget. Without this macro, there is no way for Qt Designer to use the widget. The MultiPageWidgetExtensionFactory class inherits QExtensionFactory which provides a standard extension factory for Qt Designer. The subclass's purpose is to reimplement the QExtensionFactory::createExtension() function, making it able to create a MultiPageWidget container extension. As described above, the factory is invoked when Qt Designer must know whether the associated widget is a container, or not. So the first thing we do in MultiPageWidgetExtensionFactory::createExtension() is to check if the QObject, for which the extension is requested, is in fact a MultiPageWidget object. Then we check if the requested extension is a container extension. If the object is a MultiPageWidget requesting a container extension, we create and return a MultiPageWidgetExtension object. Otherwise, we simply return a null pointer, allowing Qt Designer's extension manager to continue its search through the registered factories. 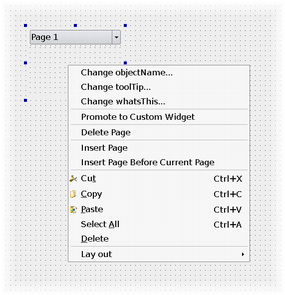 The MultiPageWidgetContainerExtension class inherits QDesignerContainerExtension which allows you to add (and delete) pages to a multi-page container plugin in Qt Designer. It is important to recognize that the QDesignerContainerExtension class only is intended to provide Qt Designer access to your custom multi-page widget's functionality; your custom multi-page widget must implement functionality corresponding to the extension's functions. Note also that we implement a constructor that takes two arguments: the parent widget, and the MultiPageWidget object for which the task menu is requested. QDesignerContainerExtension provides a couple of menu entries in Qt Designer's task menu by default, enabling the user to add or delete pages to the associated custom multi-page widget in Qt Designer's workspace. In the constructor we save the reference to the MultiPageWidget object sent as parameter, i.e the widget associated with the extension. We will need this later to access the custom multi-page widget performing the requested actions. You must reimplement addWidget() adding a given page to the container, count() returning the number of pages in the container, and currentIndex() returning the index of the currently selected page. You must reimplement insertWidget() adding a given page to the container at a given index, remove() deleting the page at a given index, setCurrentIndex() setting the index of the currently selected page, and finally widget() returning the page at a given index. The MultiPageWidget class is a custom container widget that lets the user manipulate and populate its pages, and navigate among these using a combobox. The main detail to observe is that your custom multi-page widget must implement functionality corresponding to the QDesignerContainerExtension's member functions since the QDesignerContainerExtension class only is intended to provide Qt Designer access to your custom multi-page widget's functionality. In addition, we declare the currentIndex and pageTitle properties, and their associated set and get functions. By declaring these attributes as properties, we allow Qt Designer to manage them in the same way it manages the properties the MultiPageWidget widget inherits from QWidget and QObject, for example featuring the property editor. Note the STORED attribute in the declaration of the pageTitle property: The STORED attribute indicates persistence, i.e. it declares whether the property's value must be remembered when storing an object's state. As mentioned above, we have chosen to store the page title using the QWidget::windowTitle property to be able to give each page their own title. For that reason the pageTitle property is a "fake" property, provided for editing purposes, and doesn't need to be stored. We must also implement and emit the currentIndexChanged() and pageTitleChanged() signals to ensure that Qt Designer's property editor is updated whenever the user views another page or changes one of the page titles. See the MultiPageWidget class implementation for more details.